A Howard grad by the name of Briggitta Hardin has won aracial discrimination case following a job interview at a sports bar where she claims she was fired for her skin color. According toThe Washington Postthe DC Bar has been accused of discrimination in the past:Hardin, who is African American, said that when Dadlani met her, he refused to shake her hand or speak with her and that she was fired within an hour. According to court records from a seven-day trial this month before U.S. District Judge Reggie B. Walton of the District, eight current or former employees, including four managers at the timeof the bar’s launch, were called by both sides to testify about their experiences working at the bar and with Dadlani. Testimony by several white ex-employees noted the absence at the time of black bartenders and Dadlani’s racially charged hiring preferences, according to Hardin’s lead attorney, Megan Cacace, of the Relman, Dane & Colfax law firm in Washington. “Witnesses testified at trial that he wanted to hire white blonde chicks or girls” as bartenders, Cacace said. Cacace said that African Americans have been hired as bartenders at the bar since the lawsuit was filed in November 2011. 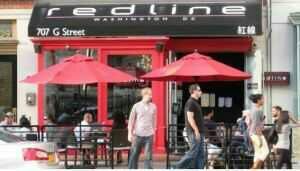 The website for Redline describes the venue as a luxury or upscale “gastrolounge and bar” featuring at-table beer taps in an 86-seat restaurant and a 130-seat sports pub next to Verizon Center.Welcome to AmeiKKKa!